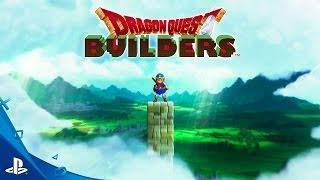 DRAGON QUEST BUILDERS is now available for PlayStation 4 and PlayStation Vita in North America! The time has come to rise as a Legendary Builder in DRAGON QUEST BUILDERS! Take up the mallet in a tale of epic proportions and explore a vast sandbox world where you will gather materials, craft items, and build everything imaginable to save the world and its people! Only you have the power of imagination and creativity to bring hope to the people of Alefgard. It’s up to you to use this power in battle against the evil Dragonlord and his treacherous minions to restore peace and rebuild the shattered realm! Build to save the world!! !